Is Africa Rising? Not yet, But It Can! Beyond Africa Rising - What Future for the 'Last Frontier'? Did Policy Shift at U.S. Summit? Why Are We So Poor? Yet We Are So Rich? Will Obama's 'New Africa' Deliver On Its Promises? Who'll Make Africa Prosperity Real? 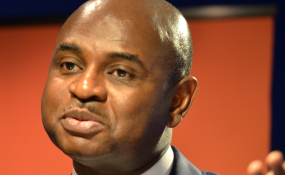 Dr. Kingsley Moghalu, deputy governor of the Central Bank of Nigeria, challenges conventional wisdoms about Africa's quest for growth in his book Emerging Africa: How the Global Economy's 'Last Frontier' Can Prosper and Matter and (pictured here), speaking at the Woodrow Wilson International Center in August 2013. Abuja — This week's U.S.-Africa Leaders Summit is one more indication of the continent’s rising profile. Seen by many as America’s response to China’s increasing influence in Africa, the question we should be asking is: for whom Africa’s future should matter most, and why? How African leaders answer this is what will influence their continent’s future and its place in the world. The 'Africa Rising' narrative of the past decade has been driven by fast-growing economies, increased macroeconomic stability and the shift of global investment interest towards the continent, largely as a result of financial crisis and recession in western economies. But there remains the pressing need for home-grown approaches to development and economic transformation that will yield better educated citizens with the right skills, better healthcare, roads and railways, and industrial manufacturing economies. There has been notable progress in countries such as Ethiopia, Rwanda and Nigeria, which has overtaken South Africa as Africa’s largest economy. But impressive growth rates, though essential for economic development, differ from economic transformation, which is what the continent really needs. Africa’s future is thus not on auto-pilot to some gilded age. The future will be one created by Africa's own economic and public policy choices. One of the most important factors that will determine Africa’s future is how African governments handle the continent’s burgeoning population, presently at over 1.1 billion but projected to hit 2.4 billion people by 2050. Will this rapid rise yield a demographic dividend of economic productivity and wealth creation, as happened in China and the United States, or become a youth bulge in which unskilled and employed youth ignite social unrest and conflict? Closely related to this demographic challenge is how African countries handle jobless and non-inclusive growth. An overarching context is that of the role of capitalism and free markets in Africa’s quest for growth and transformation. The 18th century economist Robert Malthus asserted that population, because it increases in geometric ratios, outpaces the earth’s power to provide subsistence - and that surely applies to Africa’s current reality. While Western countries - and, increasingly, parts of Asia - have escaped this conundrum by controlling population growth and revolutionizing agriculture and boosting crop yields with science and innovation, Africa is still caught in the Malthusian trap. The continent is yet to improve its agriculture beyond subsistence levels with advanced technologies. Our countries export mostly raw commodities with little or no value added. And at least 13 percent of our youth are unemployed because jobs are not being created at a faster rate than population growth. Meanwhile, African nations have enthusiastically embraced free markets and private-sector led growth without interrogating fully the nature and limitations of capitalism. The real task for African governments in shaping the continent’s future is to deploy capitalism not as if the free market is an end itself but is a means to a larger end. The goal has to be lifting the continent’s millions out of poverty and into the middle class through inclusive growth and wealth creation. African countries such as Kenya are leading the way in the area of financial inclusion, through innovation that offers lessons to the rest of the world in mobile telephone banking and payment systems. However, a more sweeping return to the drawing board is required. First, African governments need to build a conceptual and philosophical framework for African capitalism that lays emphasis on inclusive wealth creation while understanding that some degree of inequality is an inherent trade-off for the reality that capitalism remains the most productive economic system in human history. Second, it is essential to understand the real drivers of the success of capitalist economies and societies - affordable capital (which is still not widely available in many African countries), property rights and the rule of law, and innovation. The role of the state and public policy remain critical. While Africa’s economic transformation will be led by business and the private sector, the strategic and enabling role of governments through sound public policy and regulatory frameworks cannot be abdicated. It is the inadequacy of the guiding hand of the state that is fuelling non-inclusive growth and building risks for Africa’s future.